By way of some people I met here in Apalachicola, Florida, I had the opportunity to learn how to Scuba Dive for the first time. I had more trouble with the swimfins than anything else, kept stepping on my own feet! 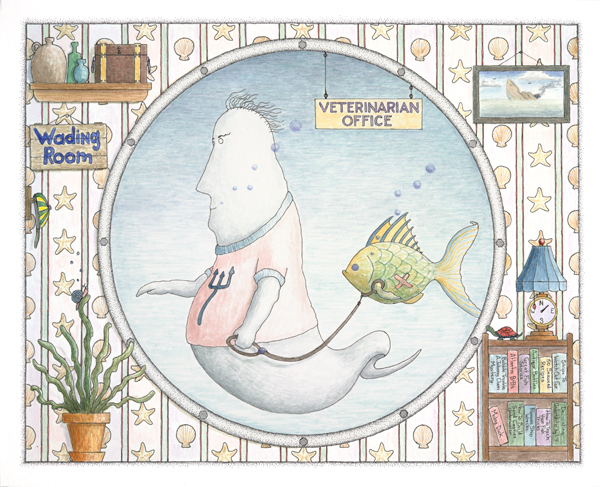 While making my way around the bottom of Apalachicola Bay at the Gulf of Mexico, I found myself swimming into a Veterinarian Office. This is one of a couple of Photo’s I took of the Doctor’s “wading room” that shows someone entering with his pet fish just in time for their scheduled appointment. Looking around the room, I found I wasn’t surprised by the absence of chairs but I was pleasantly surprised to find among the reading material, the highly regarded book (by undersea architects & designers) “Underwater Decorating” by popular designer and concert aficionado L.T. For those concerned with the welfare of the pet fish, his visit was to check for any infection from a cut he had received from a rusty nail of an old submerged rowboat. He left the Doc’s office one very happy little fish. Besides no infection, his original band aids were replaced by the latest edition aquaman band aids that would make him the talk of his school. Air supply getting low, so it’s back to the surface, and later a light evening meal, some good music at the local inn and then back on the road to Ukazoo in the morning.